Over the past decade, RPM International has been able to hike dividends at a rate of 5.60%/year. A $1,000 investment a decade ago, would be generating $57.50/year in dividend income, assuming all dividends were spent and never reinvested.The company has managed to grow its earnings from $1.64/share in 2007 to $2.47/share in 2017. The 2017 figures are adjusted for one-time expenses. RPM International is expected to earn $2.87/share in 2017. Currently, the stock is slightly overpriced at 20.30 times earnings and yields 2.10%. Depending on how conservative you want to be, it may be worth a look below $57/share using projected earnings or on dips below $49/share using last years earnings. I especially liked the following passage from their latest annual report: Paying a dividend and increasing it annually, which we have done for 43 consecutive years, is a key to the impressive total return we have been able to deliver to our shareholders. Very few companies can boast of such a record. In fact, less than half of one percent of all 19,000 publicly traded companies have paid an increasing cash dividend for this period of time or longer, according to the Mergent Handbook of Dividend Achievers. We last increased the dividend on October 6, 2016, by 9.1 percent to $1.20 per share annually. It is a track record of which we are very proud and intend to continue, rewarding our long-term shareholders for their loyalty. Honeywell International Inc. (HON) operates as a diversified technology and manufacturing company worldwide. It operates through four segments: Aerospace; Home and Building Technologies; Performance Materials and Technologies; and Safety and Productivity Solutions. The company raised its quarterly dividend by 12% to 74.50 cents/share. This marked the 8th consecutive annual dividend increase for this dividend contender. 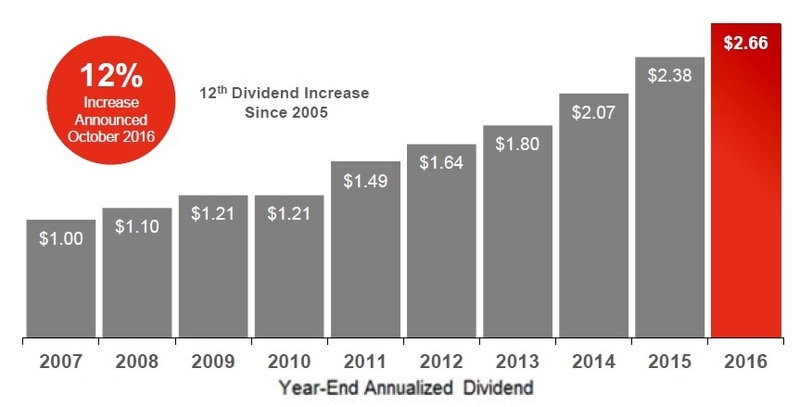 Over the past decade, Honeywell has been able to hike dividends at a rate of 10.40%/year. A $1,000 investment a decade ago, would be generating $48//year in dividend income, assuming all dividends were spent and never reinvested. The company has managed to grow its earnings from $3.16/share in 2007 to $6.20/share in 2016. Honeywell is expected to earn $7.09/share in 2017. Currently, the stock is slightly overpriced at 20.30 times earnings and yields 2.10%. Depending on how conservative you want to be, it may be worth a look on dips below $142/share using projected earnings or on dips below $124/share using last years earnings. Northwest Natural Gas Company (NWN) stores and distributes natural gas in the United States. The company operates in two segments, Local Gas Distribution and Gas Storage. The company raised its quarterly dividend by 0.50% to 47.25 cents/share. The current yield is 2.90%. This marked the 62nd consecutive annual dividend increase for this dividend king. Unfortunately, the company's dividend increases are very measly. Over the past decade, it managed to hike them at a rate of 3%/year. A $1,000 investment a decade ago, would be generating $40/year in dividend income, assuming all dividends were spent and never reinvested. However, the rate of dividend growth has been decelerating since from at already low figure over the past 1, 3 and 5 years. Earnings per share declined from $2.76/share in 2007 to $2.12/share in 2016. The company is expected to earn $2.17/share in 2017. 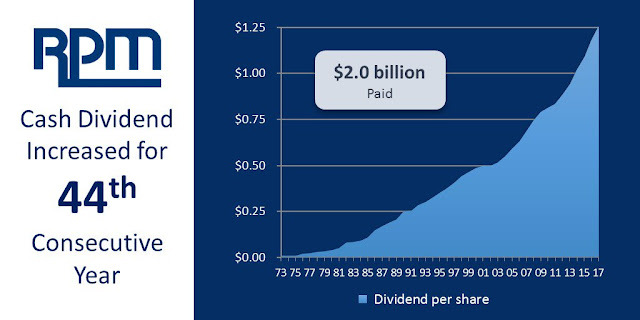 In addition, the dividend payout ratio is high at 87%. The lack of earnings growth and the high dividend payout ratio explain the reasons behind the slow rate of annual dividend growth. Dividend increases are running on fumes for Northwest Natural Gas Company. Right now, this stock is overvalued at 29.90 times forward earnings. I would not consider this company right now, because it is overvalued, has a very high dividend payout ratio and has almost no dividend growth.